Neighbourhood Officer Constable Kent Vuong knows one of the greatest powers he has in his job is bringing people together to solve a community problem. Over the past few years, graffiti tags have blighted the gateway to East Chinatown at Gerrard St. and Broadview Ave. where the Zhong Hua Men Archway stands. It’s a traditional Chinatown gate welcoming visitors to the bustling Asian business community. Behind the archway is a building constantly targeted by taggers. 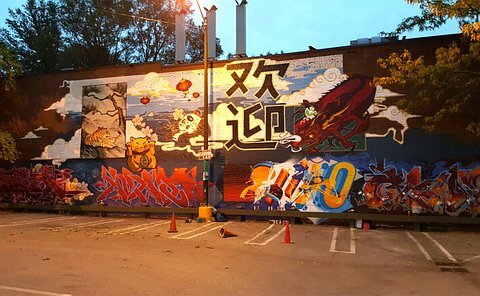 Chinese Chamber of Commerce East Toronto Vice-President Valerie Mah and other community members have tried to keep the buildings free of illegal graffiti but had been unsuccessful. 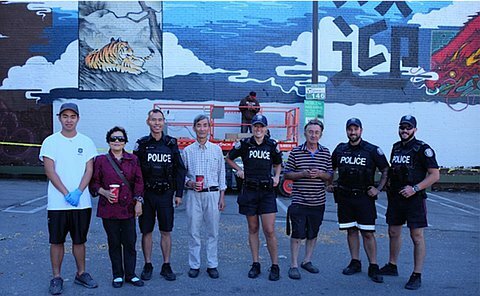 Constable Vuong decided to link the business community with the budding artistic community in the Division. 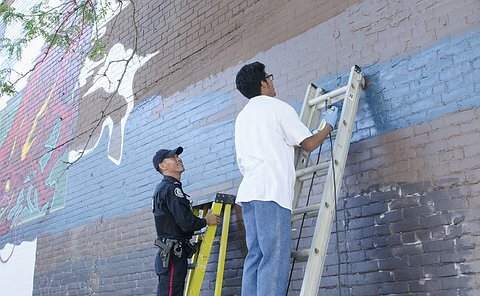 With the support of officers at 55 Division, he organized a mural contest for art students from Riverdale Collegiate Institute to beautify the wall. Grade 13 student Alexi Li was excited to be part of the project. His drawing of a tiger is part of the art work on the wall. 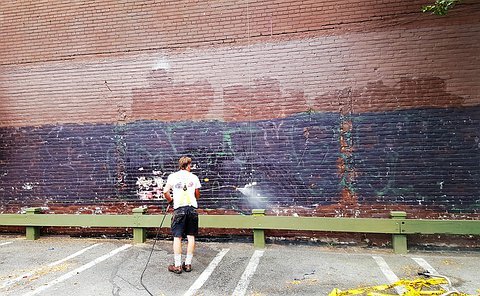 Angel Carrillo, who has been painting murals since 1995, helped the students with the mural project to enhance the community’s vibrancy. TPS Auxiliary officers and 55 Division Youth in Policing Initiative (YIPI) students Edceljeric Jabis, Peter Dadesse and Saravanan Phazakni helped with the assignment. Vuong thanked the participants for their support.